Here I am again, writing about food on a Friday. I said that Foodie Friday was not going to be a regular occurrence on this blog because this is not a food blog, and I am not a foodie. However, this is a blog about running, strength training, and nutrition, so it only makes sense that I share the healthy and delicious recipes I love. Crown publishing sent me a copy of Shalane Flanagan's "Run Fast. Cook Fast. Eat Slow." 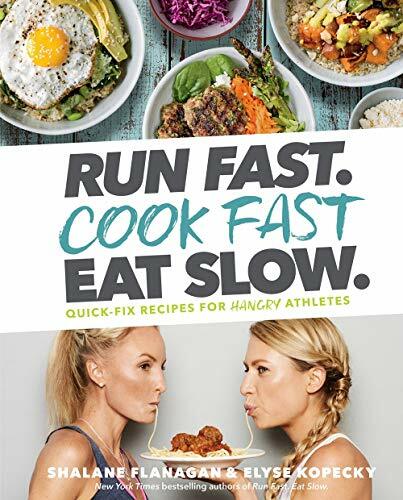 cookbook for athletes, and I've made it a theme on the blog this week. On Monday we covered EAT SLOW, Wednesday, RUN FAST and today we'll COOK FAST. Stay tuned to the end of this post to learn how to enter a giveaway to win your own copy. Hubby handles most (ok all) of the cooking at our house, but I have figured out how to prepare simple and healthy meals. I'm not comfortable with experimenting, so when I get a cookbook like "Run Fast. Cook Fast. Eat Slow." I can dive right in and follow the simple instructions for healthy and delicious recipes. 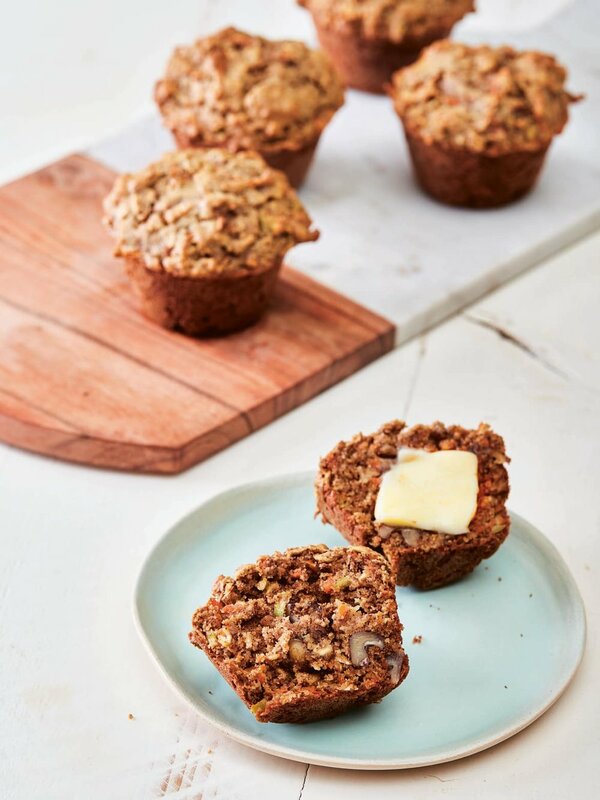 The first recipe I tried in the cookbook was the delicious Apple Carrot Superhero Muffins. The first batch disappeared quickly with hubs asking when I was planning on making them again. I had most of the ingredients already in my pantry (I had to buy almonds and walnuts), and the muffins came together so simply, I will likely make these again real soon. RUN FAST. COOK FAST. EAT SLOW. Superhero muffins recipe. Save to your favorite Pinterest board for later. Position a rack in the center of the oven. Preheat the oven to 350°F. Line a 12-cup standard muffin tin with paper muffin cups. In a large bowl, combine the almond meal, oats, cinnamon, baking soda, salt, and walnuts, raisins, or chocolate chips (if using). In a separate bowl, whisk together the eggs, apple, carrot, melted butter, and honey. Add to the dry ingredients, mixing until just combined. Spoon the batter into the muffin cups, filling each to the brim. Bake until the muffins are nicely browned on top and a knife inserted in the center of a muffin comes out clean, 25 to 30 minutes. Allow muffins to cool completely before storing. Store leftover muffins in an airtight container in the fridge or freezer. If you like them warm, reheat on low power in the microwave. *If you have a high-powered blender, you can make your own almond meal (flour). For 2 cups of almond meal, pulse 10 ounces of whole raw almonds on high speed until finely ground. Want to win this cookbook for yourself? It's so easy to enter! No jumping through hoops! Just simply leave a positive comment on this blog post and I'll randomly select a winner from all entries. Want to change your life? In this post you will discover how to start small and use momentum to build the habits that lead to a healthy lifestyle. You’ll also learn to recognize the thought patterns that lead to negative momentum that can sabotage results. Don’t just read, take action on this post for best results. As an advocate for moderation in nutrition and fitness I can accept that moderation doesn’t work for everyone all the time. It’s important to keep an open mind and adjust your lifestyle choices based on your results. If moderation isn’t working for you, what else can you try? I believe in everything in moderation, including moderation. Try my five strategies to kick-start fat loss over the next 30 days.